China’s aggressive territorial claims, Washington's "pivot" to Asia and attempt to contain China, and Japan’s hawkish bluster add up to a volatile brew in the Asia-Pacific. The Asia-Pacific region is descending into a period of destabilizing conflict. A storm is brewing in the Western Pacific. As the Asia-Pacific region descends into a period of destabilizing conflict, the Philippines is quickly becoming a frontline state in the U.S. strategy to contain China—the central thrust of the Obama administration’s so-called “Pivot to Asia.” In the most recent development, the Philippine government has offered the United States greater access to its military bases. China’s controversial moves in the Western Pacific have served as a convenient excuse for heightened U.S. military presence in the region. In particular, Beijing’s claim of the whole South China Sea (now also called the West Philippine Sea) as Chinese territory has allowed the United States to portray itself as indispensable for protecting the region’s smaller countries from Chinese hegemony. A one-time U.S. colony and ally, the Philippine government has been especially receptive to Washington’s siren call. July 24 marks the first anniversary of Beijing’s creation of “Sansha City” to “administer” the whole West Philippine Sea and the islands and terrestrial features it claims. Among these are the Spratly Islands, nine of which are claimed and occupied by the Philippines, along with Scarborough Shoal, Ayungin Shoal, Panganiban Reef, and Recto Bank, all of which are claimed by the Philippines. The last few months have seen a series of provocative Chinese moves. These include the occupation of Scarborough Shoal, or Bajo de Masinloc, by up to 90 Chinese ships, which have barred Filipino fishers from the area; an increased Chinese military presence at Ayungin Shoal; and a Chinese general’s brazen presentation of the so-called “Cabbage Strategy.” The thrust of the Cabbage Strategy, Major General Zhang Zhaozhong explained, was to surround Bajo de Masinloc, Ayungin Shoal, and other Philippine territories with a massive Chinese naval presence to starve Filipino detachments and prevent reinforcements from reaching them. Accompanying the note was the infamous “nine-dash line” map demarcating China’s claims in the region. No official explanation for the nine-dash line was provided at that time or since, though there have been unofficial references to the islands and waters of the West Philippine Sea being ancestral Chinese territories, and to their inclusion in maps of the defunct Nationalist Chinese regime that date back to the late 1940s. Among the brazen claims of the nine-dash line document is that the nine Spratly Islands and terrestrial features that have long been a municipality of Palawan, a province of the Philippines, belong to China. The Kalayaan Island group is about 370 kilometers (230 miles) from Palawan and some 1,609 kilometers (1,000 miles) from China. A clear implication is that the Bajo de Masinloc, which is 137 kilometers (85 miles) from the province of Zambales and is an integral part of it, also belongs to China, which is 700 kilometers (434 miles) away. Yet another assertion is that the Philippines, and the four other claimants to all or part of the to South China Sea (Brunei, Malaysia, Taiwan, and Vietnam), are not entitled to their 200 Nautical Mile Exclusive Economic Zones (EEZs) under the United Nations Convention on the Law of the Sea (UNCLOS), since the whole area falls under China’s “indisputable sovereignty.” What most of the other claimants are left with are only the territorial waters that extend 12 nautical miles from their respective coasts. But the South China Sea disputes go beyond the interests of the six claimant countries. For what China is saying with its nine-dash line is that a body of water that is 3.5 million square kilometers in size—which borders six states, and through which transits one third of the world’s shipping—is the equivalent of a domestic waterway like Lake Michigan in the United States. If allowed to stand, many analysts conclude that the nine-dash line claim will amount to one of the greatest maritime grabs in history. China’s interest in the rich fisheries and oil and gas reserves of the South China Sea is longstanding. Its behavior, however, has grown more aggressive recently. There are two theories about the mainsprings of Chinese behavior. The first says it stems from insecurity. China’s increasingly aggressive stance stems less from expansionist intent than from the insecurities brought about by high-speed growth followed by economic crisis. Long dependent for its legitimacy on delivering economic growth, China has recently experienced domestic troubles related to the global financial crisis that have left the Communist Party leadership groping for a new ideological justification. It has found this in virulent nationalism. The second theory is that China’s moves reflect the cold calculation of a confidently rising power. It aims to stake out a monopoly over the fishing and energy resources of the West Philippine Sea in its bid to become a regional, and later a global, hegemon. But more disturbing is the fact that Beijing may be forcing them, including Washington’s former enemy Vietnam, into the hands of the of the United States by allowing Washington to portray itself as a military savior or “balancer” to Beijing. If China feels threatened by the closer military relations the United States is developing with its neighbors, it largely has itself to blame. The “Contain China” strategy was put on hold after 9/11, owing to Washington’s drive to win allies for its “War on Terror.” But while it is not new, there is an urgency to the containment strategy under Obama owing to developments in the intervening decade. To many analysts, the Pivot actually represents a retreat from the comprehensive global military dominance that the neoconservative faction of the U.S. ruling class attempted under Bush. It is a feint, a maneuver designed to serve as a cover for a limited retreat from America’s disastrous intervention in the Middle East and Southwest Asia. It is an attempt by Washington to retreat to an area for imperial power projection that it sees as more manageable than a Middle East that is running out of control. To be sure, Washington has always treated the Western Pacific like an American lake. At its height in the post-World War II era, the U.S. presence amounted to that of a transnational garrison state spanning seven countries and political entities in the Western Pacific and Australia. Nevertheless, the Pacific Pivot has intensified the already intense militarization of the area. Sixty percent of U.S. naval strength has been shifted to the Western Pacific. 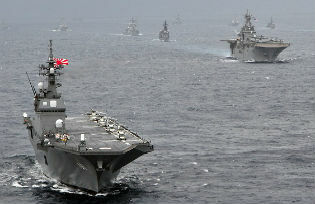 This has been accompanied by the accelerated deployment of U.S. Marine Corps units from Okinawa to Guam and Australia. U.S. Special Forces continue to participate in the campaign against radical Islamists in the Southern Philippines, while conducting amphibious and naval exercises with Philippine military units near the disputed Spratly Islands and Scarborough Shoal. The most recent development is that the Philippine government will allow greater U.S. access to Philippine bases, including the former massive U.S. naval complex at Subic Bay. Twenty years after giving up its bases in the country, the United States is back with a bang in the Philippines. The U.S. build-up in the Philippines, some Filipino commentators have pointed out, is self-defeating, since the dynamics of conflict between the superpowers have set in, marginalizing any effective resolution to the territorial disputes that Washington’s military presence was supposed to facilitate in the first place. U.S.-China sparring is worrisome enough, but there is a third source of destabilization in the region: Japan. Right-wing elements there, including the current Prime Minister Shinzo Abe, have taken advantage of China’s moves in the West Philippine Sea and Japan’s dispute with Beijing over the deserted Senkaku Islands to push for the abolition of Article 9 of the Japanese Constitution, which prohibits war as an instrument of foreign policy and prevents Japan from having an army. The aim is to have a foreign and military policy more independent from the United States, which has managed Tokyo’s external security affairs ever since Japan’s defeat during the Second World War. Many of Japan’s neighbors are convinced that a Japan more independent from the United States will develop nuclear weapons. They fear the prospect of a nuclear-armed Japan that has shed its post-war pacifism and not yet carried out the national soul searching that in Germany embedded responsibility for the atrocities of the Nazi regime in the national consciousness. This failure to institutionalize and internalize war guilt is what allowed the mayor of Osaka, Toru Hashimoto, to assert recently that the estimated 200,000 Korean, Chinese, and Filipino “comfort women“—women captured into sexual slavery by Japanese troops in the Second World War—were “necessary” for troop morale. The Osaka mayor’s remarks came in the wake of another scandal: a mass visit in April by some 170 sitting legislators and members of Prime Minister Shinzo Abe’s cabinet to the Yasukuni Shrine, the home of Japan’s war dead, which includes among its honorees 14 convicted war criminals. Japan’s neighbors have long condemned the ritual visit of Japanese leaders to Yasukuni as a sign of the country’s unrepentant attitude for its conduct during World War II. Yet there are disturbing signs that long held stances toward Japan’s remilitarization are softening. The Foreign Secretary of the Philippines, Albert del Rosario, for instance, has gone on record recently to support Japanese rearmament in order to contain China’s hegemonic behavior. China’s aggressive territorial claims, Washington’s “pivot,” and Japan’s opportunistic moves add up to a volatile brew. Many observers note that the Asia Pacific military-political situation is becoming like that of Europe at the end of the 19th century, with the emergence of a similar configuration of balance of power politics. It is a useful reminder that while that fragile balancing might have worked for a time, it eventually ended up in the conflagration that was the First World War. Foreign Policy In Focus columnist Walden Bello has written extensively on developments in the Asia Pacific region.